All children must be toilet trained. No diapers or pull-ups. 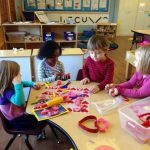 Gross motor and fine motor development, physical health, nutrition, safety, and self-care. 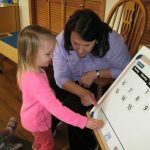 Teachers observe the children during their interactions to assess developmental readiness, implementing programs with careful attention to the differing needs of each child. 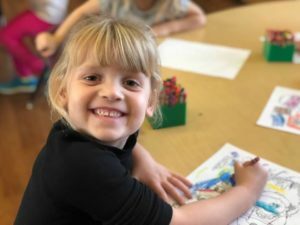 GROUP TIME: The Teacher gathers the children together for a Bible story, children’s stories, songs, poems, music, calendar, weather, EZ write strokes, and art. SNACK TIME: Children wash their hands and are offered a healthy snack from two different food groups. They are encouraged to try new foods, pour their own beverages, use table manners, and clean up after themselves. 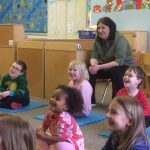 We are an allergy-friendly preschool. We will accommodate all food allergies with an alternative snack. 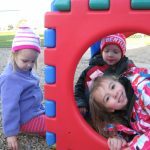 LARGE MOTOR TIME: Children complete their day using large motor skills outside in the fenced-in playground. Indoor activities are provided when the weather does not allow for outdoor play.